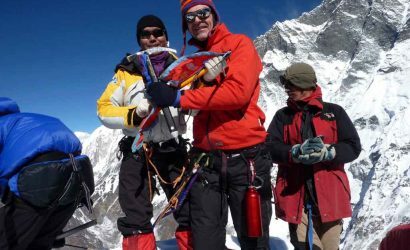 The Everest Base Camp trek via the challenging Chola pass is one of the most adventurous treks in the Khumbu region. 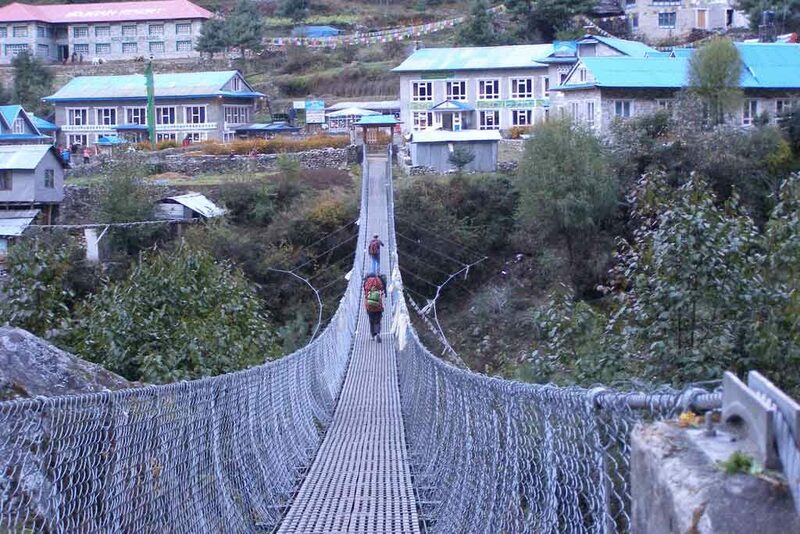 This unique trek goes through the home of the legendary Sherpa people- Namche Bazaar. The route then passes following the Dudh Koshi River to its source- the Gokyo Lake to the west of the Everest Base Camp. The trek starts at Lukla reached after a 35-minute scenic flight from Kathmandu. Then we continue towards Namche Bazaar and all the way to Gokyo Valley, Chola Pass and finally Gorakshep. 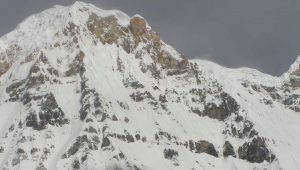 We will continue our journey to the Mount Everest Base Camp and Kalapatthar on the following day. 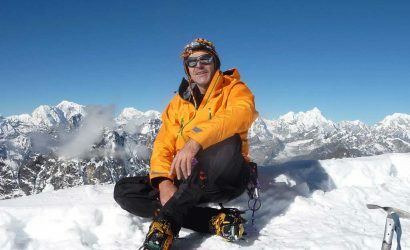 Therefore, the Gokyo-Chola pass-Everest Base Camp trek is also known as the Everest Circuit trek. 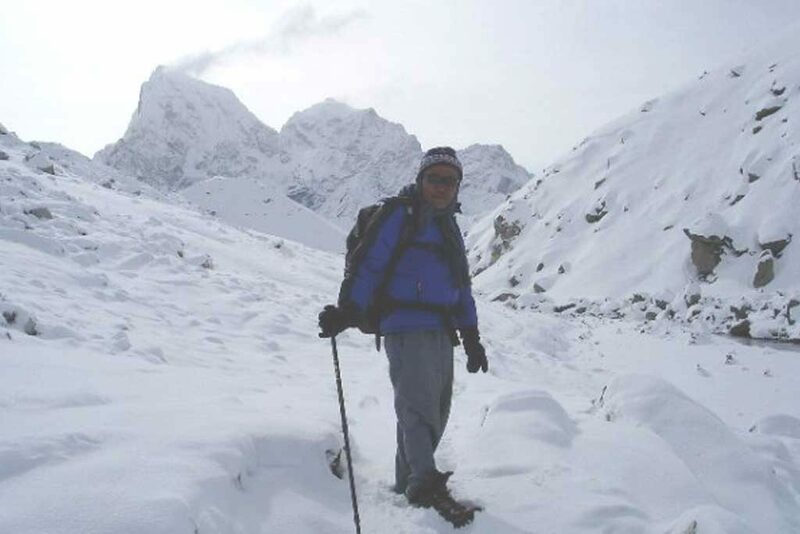 This exceptional trek rewards with the panoramic views of Cho Oyo, Makalu and Mt. Everest of course. The dramatic landscape from the summit of Gokyo Ri (5,360m/17,586ft) is truly impressive. 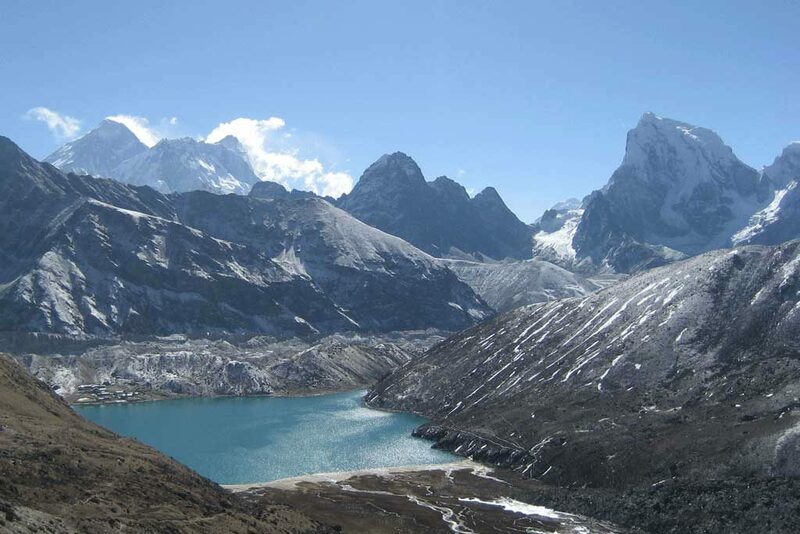 One of the major attractions of this trek is the Gokyo Lake situated in the Gokyo Valley. An excursion to the fourth and fifth lakes would be an extra adventure from Gokyo. Gokyo Ri refers to as the best view point in the entire Everest Region for more spectacular scenery than that from the Kalapatthar. We are then ready for the return trek to Lukla following through the beautiful Thyangboche monastery and Namche Bazaar. 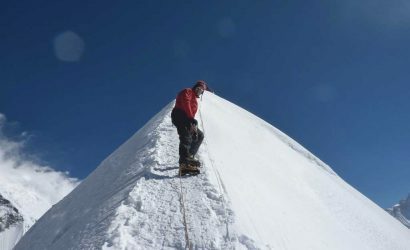 Lobuche or Island Peak climbing is a more popular trip extension to this trek. Today we stay in Namche Bazaar for acclimatisation. Because of the altitude, it will be necessary for us to spend a minimum of two nights here. 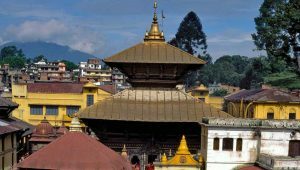 On this day, we have the choice of just relaxing and roaming round this interesting hill town, or alternatively trekking round a nearby 3-4 hour circuit with stunning views. This day helps a lot for acclimatisation for our further trek to Gokyo, Chola pass and Everest Base Camp. Today we start from Namche Bazaar on a trail with gradual ups and downs. We might be able to witness Himalayan pheasants, musk deer and Himalayan Thars on the way. Our trek then enters into the Gokyo valley at Sansa. The trail climbs through rhododendron forest and comes to a point where, for the first time, we will be able to see Mt. Cho Oyu (8,201m/26,907ft) at the head of the valley. The route now makes twisting ascents through woodland, climbs more steeply into the open, crosses a number of streams, traverses a yak pasture with a solitary herder’s hut, crosses a minor ridge and enters our overnight stop, the lodge settlement of Dole. 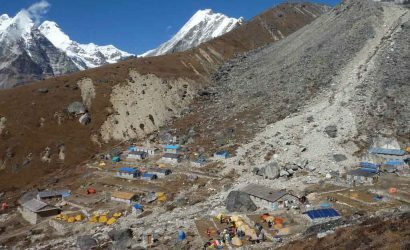 Dole began as a kharka (a yak pasture) with a few herders’ huts, but once Gokyo became a trekking destination, lodges soon established more rapidly. Trekking time 5-6 hours. Today's trek is a short and pleasant one and we can relax and take things easy. Because of the demands of altitude acclimatisation, we do not go further. Beyond the first of Dole’s lodges the trail goes downhill, crosses a stream, swings right to climb a hillside and crosses pastureland with dry stone walls and several yak herders’ huts. The trail continues past a few stone-built huts and contours along the hillside, descends into a small basin with more walls, stone huts and lodges, then just under two hours from Dole reaches Luza (4,360m/14,305ft) which is also a kharka (yak pasture). Because the lodges at Dole and Machhermo can be very busy in the autumn trekking season, it has become a possible site for overnight accommodation. From Luza, the path climbs out of the northern side of the basin and crosses more pastureland bordered by a chorten and prayer flags. In every direction here the views are spectacular. Eventually the trail slopes down into the valley, crosses a stream and rises up a short slope into the yak pastures and lodges of our overnight stop Machhermo. Trekking time 3-4 hours. 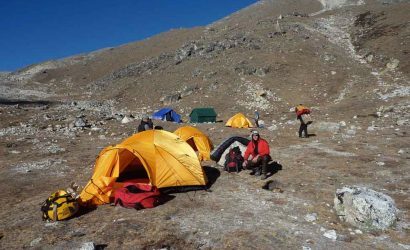 Today will be another relatively short trek across broad pastures, through narrow clefts with steeply climbing trails, past two or three lakes and through an ablation valley beside the Ngozumpa Glacier. An ablation valley is one formed by the melting of glacier ice. 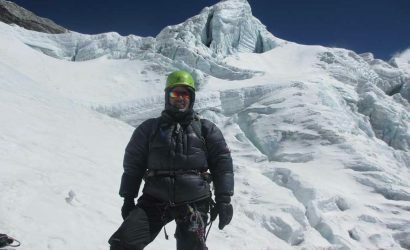 The trail climbs round a hillside spur, where lofty Cho Oyu will again come into view and soon we will reach another kharka with some simple lodges. Directly ahead of us at this point, we will see the terminal moraine (ridge of rocks) that closes off the Ngozumpa Glacier. The trail now goes briefly downhill, then climbs through the aforementioned ablation valley on the western side of the glacier, goes steeply up stone steps and crosses a stream on a short wooden bridge. A succession of cairns now marks the route through a stony landscape, with a small tarn (Mountain Lake) on the left. The valley now broadens and the trail reaches a second larger tarn Taboche Tsho (4,740m/15,552ft). Beyond this point the trail passes through a narrower section of the ablation valley and comes to a third tarn Dudh Pokhari (4,750m/15,584ft), with prayer flags on its eastern shore. 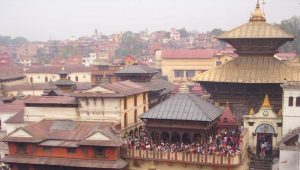 Dudh Pokhari celebrates a fair every year during Janaipoornima, a popular Hindu festival falls in July-August. Just beyond this lake we will come to our overnight stop Gokyo, the valley’s last lodge settlement. Trekking time 3-4 hours. From Pheriche, we leave mountains behind us and the descent takes us through the Tengboche Monastery back to Namche Bazaar. We stay overnight at Namche Bazaar. Trekking time 5-6 hours.